On the 13th Feb 2018 we had a new Vision 500 stove fitted. Well I would just like to say a very big thank you for supplying a magnificent stove. We are so delighted with it as it almost has the control of a gas fire. The fitters couldn’t have been nicer also and were prepared to help us with everything, very clean and efficient so congratulations to them both. After we told him about the removal of the centre wall of our lounge he then calculated the size and output of heat we needed, otherwise we would get far too hot in the room as it was. We have two old cottages converted to one so we needed something substantial to heat it. The Length of our room is 5.800cm x 3.500 but goes into an L shape room which is 6 metres across. The height is 2.200cm. 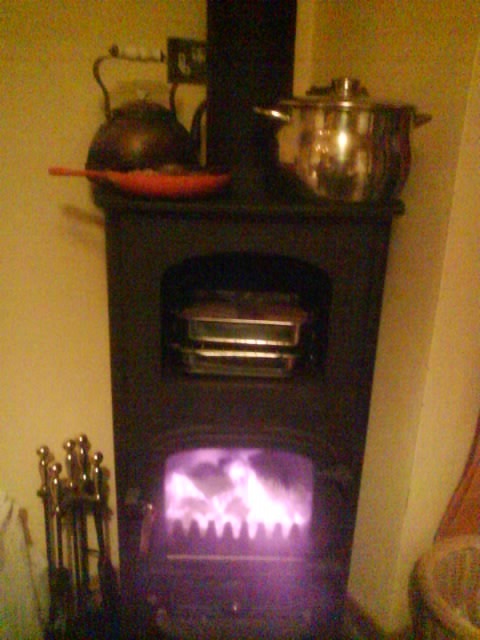 We have noticed that the stove is so efficient it actually turns off the central heating as the cottage warms up. ( A saving of oil there ). Not only did the fitters put the stove in they repointed the whole of the inside to give a beautiful finish as you can see. We also were supplied with a starter kit which included A few logs, kindling wood, fire lighters and a lovely pair of heatproof gloves for handling logs and controlling the fire. We can’t emphasise enough the amount of heat output this vision 500 gives out. The quality of this stove is second to none with its clear glass and efficient way it burns in its own gases. And we don’t have to empty the ash can every day because it burns so hot the ash is just dust ( Amazing ). I would say its one of the best investments I’ve put my money into. Well what more can I say as you can see we are bowled over by this stove. We just wish we could have afforded one years ago, but we have now !!!! So thank you all one again, From a very pleased and happy couple. 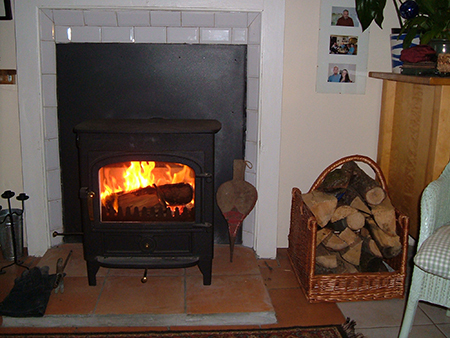 We purchased a Pioneer 400 last year from New Forest Woodburning Centre. Thought you might like to see a picture of it in situ. The first was taken recently at night with the fire going and Poppy, one of our cats, taking full advantage of the warmth. I think she was trying to emulate the earthenware cat on the right! Made us smile anyway! The other two were taken not long after the Pioneer was installed. 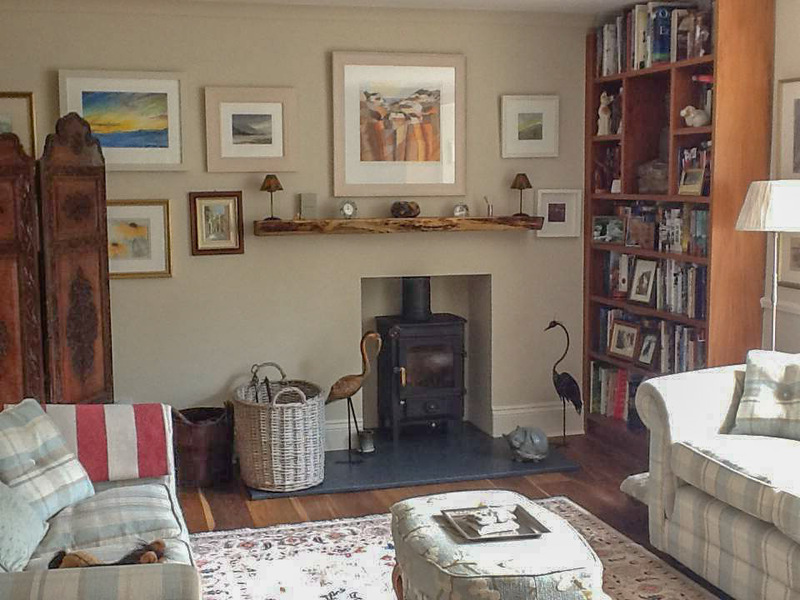 We are delighted with it and glad we changed from our previous open fire - certainly helps keep our old cottage warmer and so cheerful. Please see our photo of a recent installation of one of your pioneer oven stoves. Your stockists M Davies Ltd in Northamptonshire fitted this stove perfectly last Friday into our inglenook and I'm sure you'll agree it was an excellent choice for the space it fills. M Davies Ltd are a credit to the Clearview brand and recommend them highly to us which we are greatful for. If anyone is wondering whether to invest in a Clearview stove rather than opt for a slightly cheaper alternative then I would encourage them to wholeheartedly to choose Clearview. It is minus 3 outside today and there is snow on the ground. We have no central heating in our two bedroom cottage and are sat here sweltering. Even the heat seeking dogs have had to find a cool spot. What a wonderful efficient stove and an excellent alternative to expensive oil or electric heating. I would not hesitate to recommend Clearview stoves as the number 1 choice for any type of fireplace. We have even saved on electricity cooking casseroles and jacket potatoes to perfection in the oven. Don't think I have ever done this before but I am so pleased with my stove I thought I must let you know. I had put in on December 16th, perfect timing as it turned out given the weather that we have been having. I live in Trowbridge in Wilts but a company in Frome, Somerset bought it on my behalf and installed it for me. I live in a two bed terraced house and have not put the central heating on since my stove was fitted. I have become obsessed with trying to achieve max performance. We love our stove which is installed in a quite small downstairs living room. Light the fire and half an hour later open the living room door and heat wafts magically upstairs. I reckon it saves us mega bucks as the oil fired central heating is rarely required. And this is all happening in Bonnie Scotland! We are about to purchase our third 20 tonne load from the Forestry Commission. Dealing with this involves much hard labour and a chainsaw. As we are now of pensionable age....76 and 67...we really need maximum benefit from this next load. Thank you again for your prompt responses. We thought you might like to see that we are now a two Clearview home! 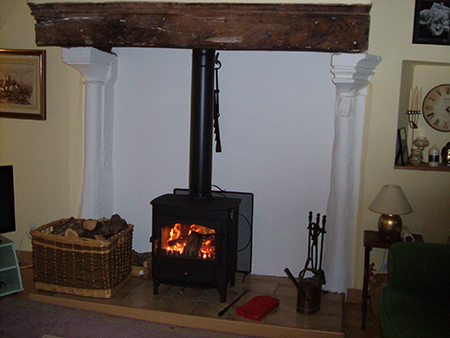 Tom fitted the second stove (the one you sent to us) last week and it is now commissioned and working well. The first picture is of our original Clearview put in about 4 years ago in the kitchen. 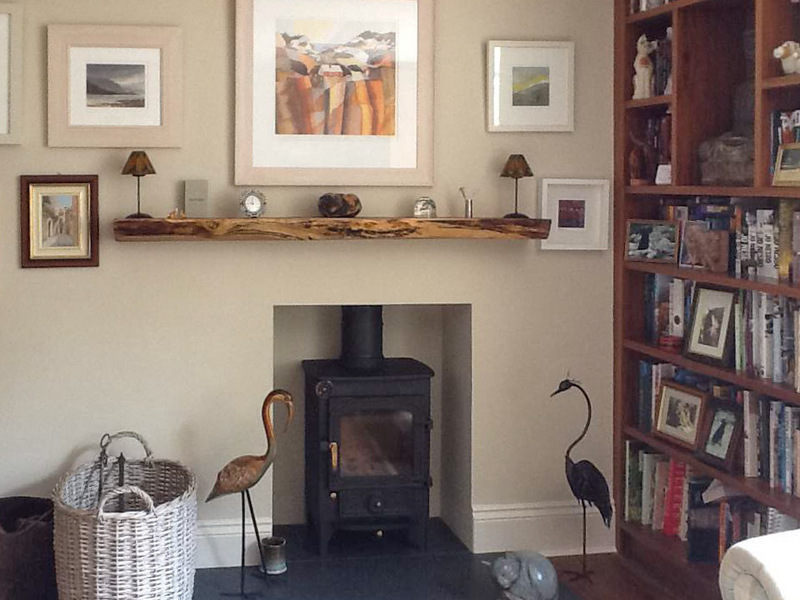 The second picture is of the new stove in our 'salon' or sitting room. We are really delighted with them both - they are so responsive and will keep us very cosy. Please find attached an image taken shortly after sunrise this morning. I moved to this house only recently, and the piece of land you see was overhung with trees. On clearing them back, I found it to be a rubble dump littered with just about everything from concrete bits to discarded pet toys, all riddled with weeds. 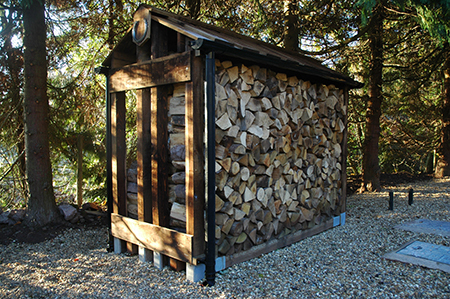 It took me some while to clear and make good, whereupon I purchased a log store from your good selves. Placed on solid compacted earth (no likelihood of sinking) surrounded by gravel, topped with guttering and finished off with a recovered horseshoe, I trust you will agree it all looks rather splendid. And I expect it do so for years to come. 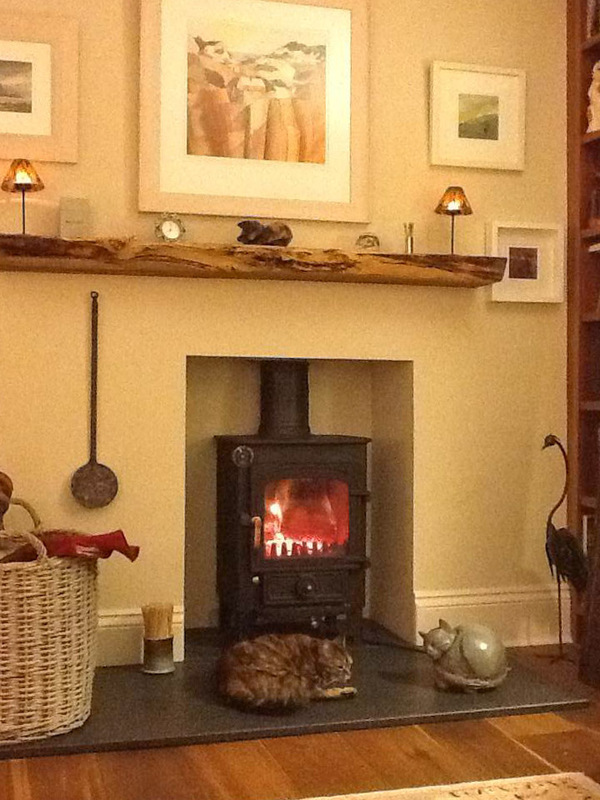 I just wanted to let you know how pleased we are with our Clearview 650 woodburner. From the moment we walked into your showrooom at Ludlow and spent time with Karen Birch who showed us around and recommended what stove to have. We ordered the stove which Karen sorted and it arrived on time by yet another very pleasant man whom I cannot remember the name of. The stove was fitted by Michael Oliver and his side kick Pete. Their workmanship was first class, they obviously made a huge amount of dust but they cleared it all up and it was a pleasure to see two people who enjoy their work and be extremely professional at the same time. Michael will be coming back to install our stone surround at a later date. 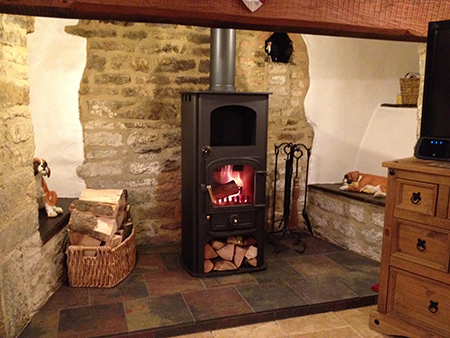 I would have no hesiation in recommending Michael and Clearview Stoves, a first class job. Thought you may enjoy this poem I was inspired to write about my wonderful Pioneer 400 Clearview stove. We're coming up to our fourth winter together, and I (and the dog) love it more than ever! Many thanks,, have a cosy winter! I want a lover like my Clearview﻿ stove. I want a love like my Clearview﻿ stove, solid and chunky, at the center of my hearth. I want a love like my Clearview﻿ stove. I want to love like a Clearview﻿ stove. 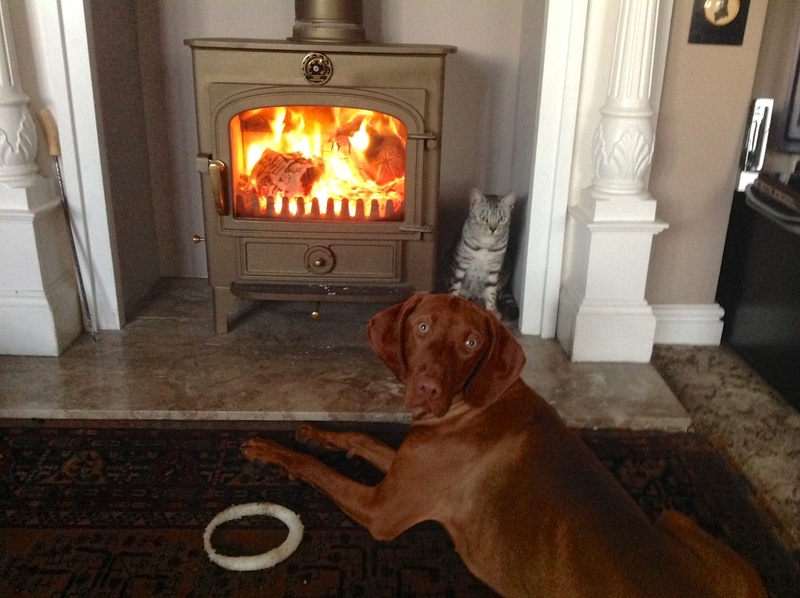 Thought you would like this pic of our pets enjoying our Clearview stoves warmth. Thought you would like this latest photo of my Jack Russell 'Milou' at home, enjoying the warmth from our Pioneer Oven last weekend! We now have the Pioneer Oven installed in our kitchen. It is absolutley fantastic! It warms most of the house and cooks most of our meals - for at least 6! Once again, we are delighted with it! I thought you might like some pictures of how we use it. I can make stock, boil the kettle and fry some onions on the top, while cooking sausages or casseroles etc inside the oven. The double decker trays work very well; I swap them round every so often to cook evenly.